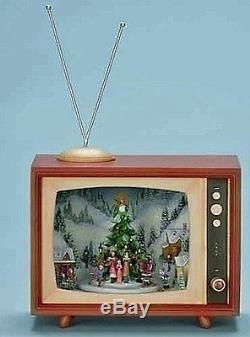 RETRO TV WITH CHRISTMAS TREE & CAROLERS - LIGHTED, MUSICAL & ANIMATED DECORATION. A CHRISTMAS CLASSIC - This magnificent decoration harkens back to the early days of television and vintage console TV's with rabbit ears! Tonight's musical special features local carolers gathered around the Village Christmas tree singing songs of holiday cheer. Medley of memorable Christmas tunes. Crafted of wood and resin and beautifully hand painted. Measures approximately 8.75"H x 10"W x 8D. Takes 3-"AAA" batteries (not included). TO VIEW A MORE EXTENSIVE COLLECTION OF CHRISTMAS GIFTS & DECOR. The item "RETRO TV With CHRISTMAS TREE & CAROLERS LIGHTED, MUSICAL & ANIMATED DECORATION" is in sale since Tuesday, June 24, 2014. This item is in the category "Collectibles\Holiday & Seasonal\Christmas\ Current (1991-Now)\Other Current Christmas Décor". The seller is "kensingtonrowcollection" and is located in Bloomingdale, Illinois.